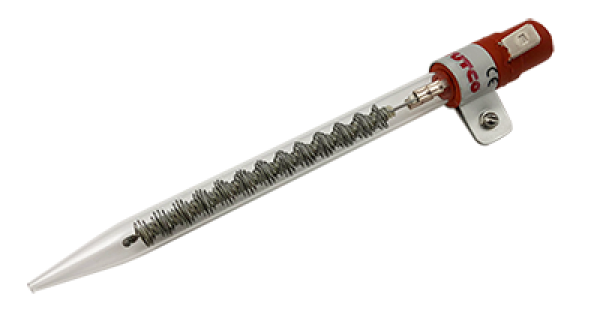 Series heaters are general purpose compact electric air heaters using Serpentine wire heating elements within a Quartz open-end ( Style A ) or nozzle ( Style B ) for spot heating applications. The Series products are typically powered by open-loop ( manual ) power controllers. The air inlet is a high-temperature silicone rubber adapter with male spade power connectors and a ground. Mounting in existing or new equipment is easy using the grounding bracket. Air is typically supplied by compressed lines. This simple method of control uses a manually operated power controller to apply a fixed voltage to the heating element. Using this system, the operator manually adjusts the controller to change heater temperature. If the airflow is suddenly interrupted, the element could fail. This is a common and inexpensive controller and often used with simple single phase standard catalog products. Series I Series I has a smaller diameter and longer tube length with a max temperature of 1400°F (760°C). Series II Same diameter as Series I, but with a smaller tube length and nominal line voltages. Max temperature 1400°F. Series III Series III Heaters have a large diameter and can reach a max temperature of 1600°F (871°C).